Heading a soccer-ball, returning a blistering tennis serve and driving the lane in a basketball game make for some exciting sports moments. But for those athletes who are participating without eye protection, these same thrilling moves can mean eye injuries and permanent vision impairment. Forty percent of all sports eye injuries occur in children between the ages of 11 to 14. Unlike many other reasons for visiting the emergency room, sports related eye injuries are preventable. Protective Sports Eyewear can help prevent injuries such as fracture of the eye socket, scratched corneas, swollen retinas and even cataracts caused by trauma to the eye. Parents of children who participate in sports should consider protective eyewear to be as essential as the face-guard on a football or baseball helmet. Sunshine Optometry is an Authorized Sport Eye Injury Prevention Center and has committed to preventing blindness caused by sports eye injuries in our community. 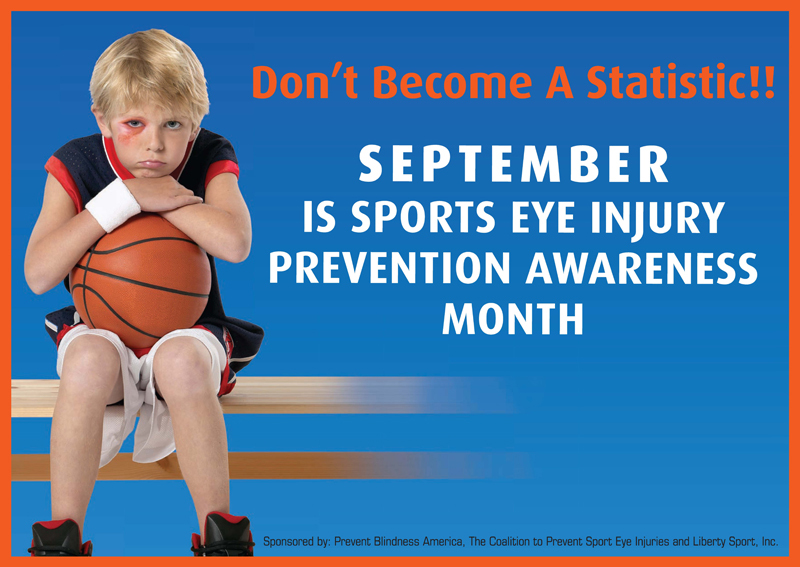 September means back to school and time for organized sports and the potential for eye injuries. This year we want to be proactive and reach out to the parents, coaches and school nurses, and encourage young athletes to have their eyes examined and be fitted for the proper protective sports eyewear. Our entire staff has received training to prevent this needless loss of sight and we have a selection of new, stylish protective sports eyewear that not only protect eyes but also look good. Which is more tragic, a blind eye or a bruised shin? Make sure when you or your child goes out onto the playing field, protective sports eyewear is part of your protective gear. • Prescription glasses, sunglasses and even occupational safety glasses do not provide adequate protection during sports. Protective sports eyewear that meets the strict standards of ASTM F803 is needed. Similarly, wearing a helmet or face guard is not enough to protect the eyes. • Polycarbonate lenses of safety thickness are the only type of lens recommended in protective sports eyewear. • Injuries are the leading cause of vision loss in one eye and second in two eyes, says the National Eye Institute (NEI). • Purchase protective sports eyewear at a reputable retailer or an eye care professional. • Choose eye protection that is the right size for the child and provides a comfortable fit. Any questions, don’t hesitate to contact our office and schedule your eye exam online today. Older PostLimited Time Offer: The Hottest Deal Ever. Free Sunglasses!